Are you looking for creative ideas for your next product or service? Have you considered the wellspring of social media conversations as a source of product or service innovation? Keep reading to discover how you can tap social media to enhance the development of your next great product. Social Media for Product Research? Yes, that’s correct… you can use social media-based conversations, feedback, comments, complaints and more as a source of research and development! This can be especially handy for smaller businesses that do not have big budgets for R&D. Social media is not as planned or controlled as a focus group when it comes to research and development; however, with concentrated time and dedication you can use these channels to your company’s advantage. And, ultimately, you can benefit the very people you’re polling about improved and new products and services. Innovation does not have to be limited to just within your company walls, so consider getting started with the following three steps. Ask yourself what you want to accomplish. Are you looking for feedback on how to improve a customer-service process within your company? Does an existing product have flaws or need a new look? Are you looking to develop an entirely new product or service? Do your customers have a need for a product or service that you have not thought of? Establishing your goals before you begin the research will allow you to develop a roadmap for success. If you know what you’re hoping to accomplish before you start, you’ll set yourself up for keeping on track, correcting if you steer off track and of course restructuring or closing down the research if you’re coming up with nothing in the area you’re seeking. Part of the roadmap of goals will need to include the arenas in the social sphere in which you will be conducting the research. Not every social channel may be the right avenue. YouTube may come in handy if you want people to watch a series of new product demonstrations. Cisco is one of many companies using social media forms, including YouTube to spread the word about new products and services to not just customers, but their large workforce as well. Twitter may be useful if you need to reach larger numbers of your audience and receive quick feedback. In 2008, Zappos asked their Twitter followers to help them rewrite the confirmation email customers receive upon placing an order with the company. They wanted to add more “pizzazz” to the piece, so they held a contest to encourage their followers to participate in the rewriting process. The company’s CEO prioritizes deep connections with the customers as a way to provide the products and services those individuals want and need. Creating a Facebook app would permit you means for social co-creation with your fans. VitaminWater sourced their latest drink flavor from participants on the company’s fan page. They offered fans the opportunity to combine their favorite flavors into a winning idea that would benefit the company with low-cost crowdsourcing and product development, and the fans with not only the chance at the $5,000 prize for the winning flavor, but creative input into a brand they value. Jonathon Meiri, creator of Superfly.com, shares how his business discovered they could harness the power of social media for product innovation. 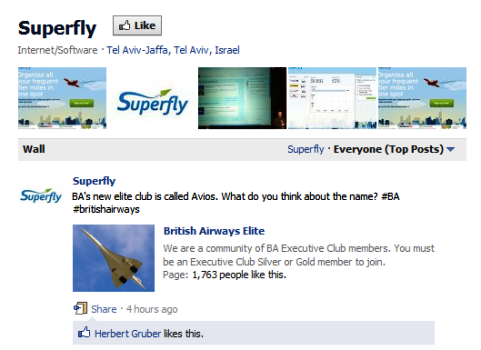 Superfly takes pride in actively driving their new product and service development from customer feedback on social sites such as Facebook. And Shashank Nigam, of Simpliflying.com, points out that many nontraditional businesses are employing social media and harnessing the power of their audience’s innovative insights. “Airlines, airports and hotels are increasingly seeing social media as an inexpensive and easy way to seek and incorporate customer feedback,” he said. For example, Estonian Air recently launched “My Estonian Air” project, where it invited members of the public to improve any aspect of the program. 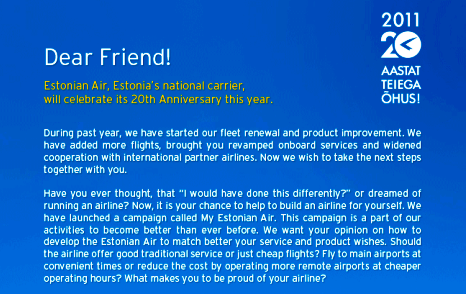 Estonian Air is asking their audience to help them build the airline from the ground up to better match the customers' service and product wishes! And another thoughtful example is Intercontinental Hotels Group. The company has a private community of its top guests who are often asked for suggestions as a substitute for focus groups. Such efforts are not only less expensive and more efficient than traditional focus groups; they also help build a relationship with the customers through engagement. 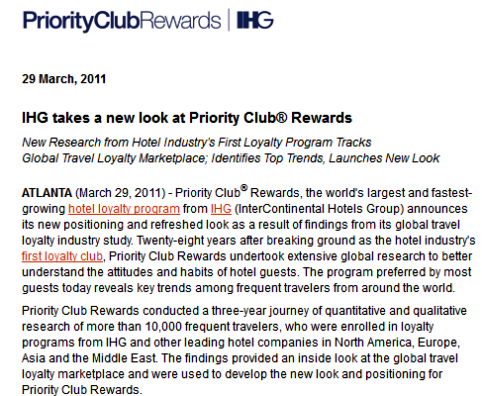 Priority Club Rewards undertook extensive global research to better understand the attitudes and habits of hotel guests. These are only a few of the considerations to weigh when establishing your research plan. Goals, tactics and implementation will vary based on the company and project needs. Your roadmap will dictate your expectations and needs for your research and help to give shape to the questions to ask your audience. While the questions asked will need to support your overarching goals for the research, they should also serve to elicit an answer too. Remember the medium you are working within. Asking formal or stale questions in an informal environment (Twitter, Facebook, a blog, etc.) may result in little or no feedback. A question that may work on your blog might not work for a Twitter audience. The response and feedback from fans was gangbusters and quite creative! After several weeks, the message was clear from all of the ballots submitted online. The audience wanted Wi-Fi on every flight. AirTran asked the right question, collected the data and delivered upon that request. 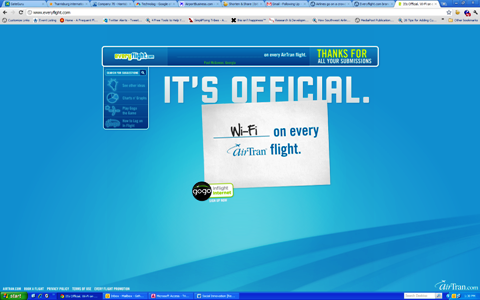 Wi-Fi is now an option on every AirTran flight! The answer to AirTran's crowdsourced question was clear: the audience wanted Wi-Fi on every flight! You may not need to create the conversation. When you begin asking your questions, you may find ongoing conversations that hold the answers you seek. Don’t be afraid to join the conversation! Organizing and recording the responses received to your relevant questions are a must. Through organization and analysis of the data, insights and trends will begin to arise and can give shape to your future product and service innovation and development. If you have indicated to your audience that you are working on an initiative and plan to carry it out, deliver on that promise. If the audience has given their time to share their needs and wants, reward that effort (within reason). Take the data collected to your development teams. If a service can be improved upon, improve it. If you have the resources to create a new product, create it. Alan Brocious, a consultant for United Concordia, shares how the company achieved great success by listening to the needs of their audience through social media to develop products to meet those needs. “United Concordia needed to find a more efficient way to communicate with the internationally based military spouse community. Many military families move from base to base across the world and have to find proper dental care at each duty post that accepts the government insurance plan managed by United Concordia. This can be a very frustrating process because of getting all the proper military paperwork in order. “By using Facebook to send targeted benefit information and answers to commonly asked questions, along with base visits, a community was created. 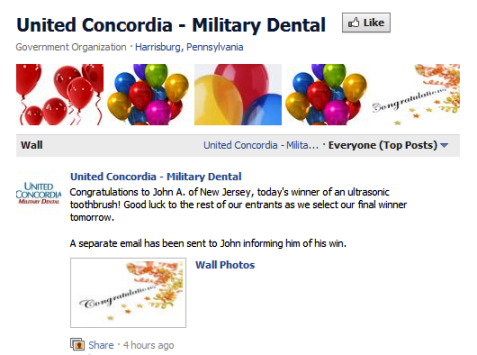 United Concordia researched needs using Facebook and is able to help thousands of military families for a much lower cost and develop relationships with the Facebook fan page members. United Concordia researched needs using Facebook. The most important thing to remember when considering all of these factors is that you’ll need to invest time and energy—this process will not happen on its own. When leveraging the opinions and thoughts of the masses, you will have to interact with them on a real-time basis. Is it worth the time invested? It certainly could be, even if just for the lessons learned! You may be surprised to learn that your customers do not just want to buy/receive products and services from your company, they want to actually participate in the process, too! Research and development is a necessary process and essential to company growth. If you are not at least researching new opportunities, critically evaluate why you are not. Social media is a cost-effective and efficient means to get started! What do you think? What do you use to listen to your customers? Leave your comments in the box below. Stephanie Gehman is the marketing manager for Harrisburg International Airport in Pennsylvania. She writes, blogs, speaks and teaches on the full gambit of traditional and emerging marketing touch points.